Many goatkeepers take their goats to shows to have them judged and hopefully win some sort of recognition whether it be rosettes, certificates, milking awards or even just kind words of encouragement! This BGS guide is aimed at newbies to the dairy goat showring, while other breed societies will look after the shows for non-dairy breeds such as Angora, Boer, English and Pygmy goats. If you are seriously considering starting to show your goats why not visit a few shows to see what is involved, watch the judging to see what is required in the ring in terms of skills and presentation and talking to exhibitors about how they prepare their goats. There are many considerations to be taken into account when deciding to show your goats. Firstly, you will need to have animals that are eligible to be entered in the shows you have identified that you would like to attend. The show season typically starts in early May and lasts until mid-October. The British Goat Society publishes a list of recognised shows both on its web site and in the Monthly Journal early in the New Year. Local goat clubs also publish lists of both recognised and un-recognised shows in their publications each year. Local unrecognised shows or Male and Youngstock shows, which normally only last one day and do not require an overnight stay, are a good place to start showing. These have declined in number in recent years, but some goat clubs still hold this type of show. Early contact with the Show Secretary to request a schedule and entry form is essential. You will need to make a note of the closing date for entries and ensure that you have submitted these prior to that date. Typically the closing date will be 4 to 8 weeks prior to the date of the show. 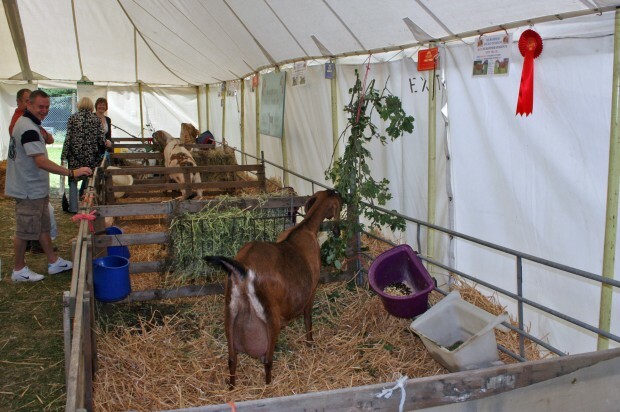 If you intend exhibiting your goats at shows where you have to be away overnight, adequate arrangements will need to be made to ensure any stock left at home are tended to. The alternative to this is to leave your stock at the show site and travel back home to look after the stock left at home, however you must of course make suitable arrangements with another exhibitor at the show to keep a watchful eye on your exhibits. To take your goats into the ring and have them evaluated and placed by a judge will require the goat being handled to its best advantage. Time will need to be spent teaching your goats to walk on a collar and lead and to stand still when the judge requires this view of your stock. Many exhibitors prefer rolled leather collars and short “traffic” leads for showing goats. They are unobtrusive and do not spoil the neck lines of a goat when in the show ring. 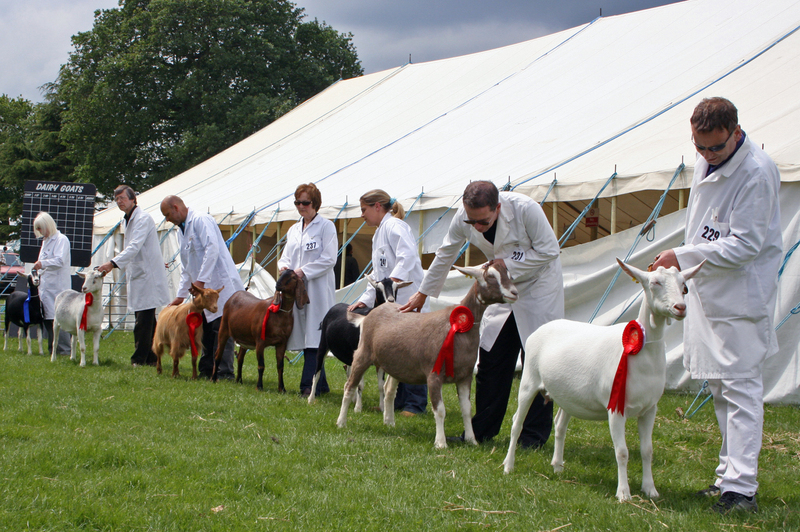 All shows that are held under the rules and regulations of the British Goat Society require that all goats presented at shows are from herds that are tested negative for CAE (Caprine Arthritic Encephalitis). Your vet will need to take a blood sample from every goat over 12 months of age and send it off for testing at a suitable veterinary laboratory. Exhibiting goats at shows requires a certain amount of extra equipment and kit. This will include items of the goats and items for your own comfort and subsistence. This list is not exhaustive! To get your goats to a show will require some form of suitable and legal transport. This will most likely be a small livestock trailer. If this is not a regularly used piece of equipment then it is a good idea to check the brakes, lights, tyre pressures and overall roadworthiness of the trailer after it may have been stored away over a winter. Oil or grease all of those parts that need a little lubrication, such as tail gate hinges and bolts. A little time spent checking the trailer in plenty of time prior to a show can save much hassle and potentially disappointment, when a repair needs doing on the morning of a planned journey to a show. Your towing vehicle also needs to be considered. You need to ensure this is well maintained, the tyre pressures have been checked to take the extra weight into account, that you have a full tank of fuel and that you have the appropriate category endorsement on your driving licence. Preparing a goat for showing is a constant job in many regards. Showing any form of livestock requires high levels of stockmanship all year round to ensure that the animals being shown are in good condition. Goats that are in poor condition should never be taken to shows. Shows which are open to the public are shop windows into the hobby and goats in substandard condition are bad adverts for the hobby. Goats that are to be shown should have their feet trimmed about a week prior to the show date. This will allow the goat to get used to the new feel of their trimmed feet and allows the small holder to carry out the task in familiar surroundings for the goat, which will reduce stress levels and the likelihood of the goat fidgeting and potentially getting injured. You can trim feet at shows, but given that the goat is in unfamiliar surroundings, it is not the preferred location for this task. Regular grooming of your goats is a good thing to do regardless of whether you intend showing your goats, but is a must for getting rid of old winter coat in the spring. Grooming is not a way of making a poor coat look good on the day of a show, but it will help enhance a good quality coat and make the final preparations at the show much easier. Good feeding and breeding is essential when trying to produce top quality show animals. Most exhibitors believe that all goats that are to be shown should be bathed and rugged up the day before a show. Not all goat-keepers do this, but it makes such a difference to the presentation of the animal. Every goat-keeper has their own methods of bathing their goats but generally the goats needs washing with a suitable animal shampoo and sponge, followed by a rinse with clean water, rubbing dry with a towel and rugging with a suitably sized goat rug. 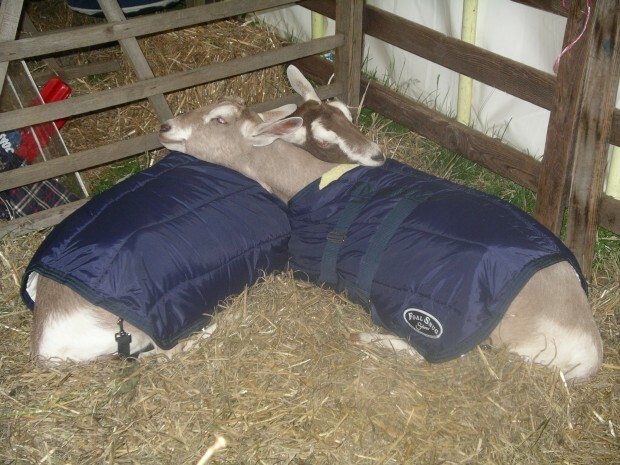 Many goat keepers make their own cotton rugs, although there are a few companies that sell these essential items. During the bathing process the goat should be suitable restrained using a suitable collar and tying up method. In summary, showing goats can be both fun and rewarding. 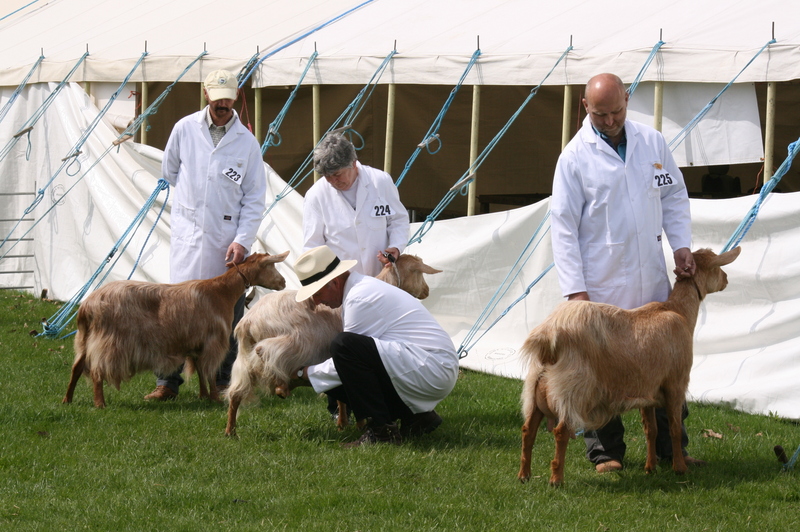 It does take a considerable amount of hard work to get your goats into show condition and maintain this, but to see your animals presented in top condition in a show ring is well worth all the time and effort.